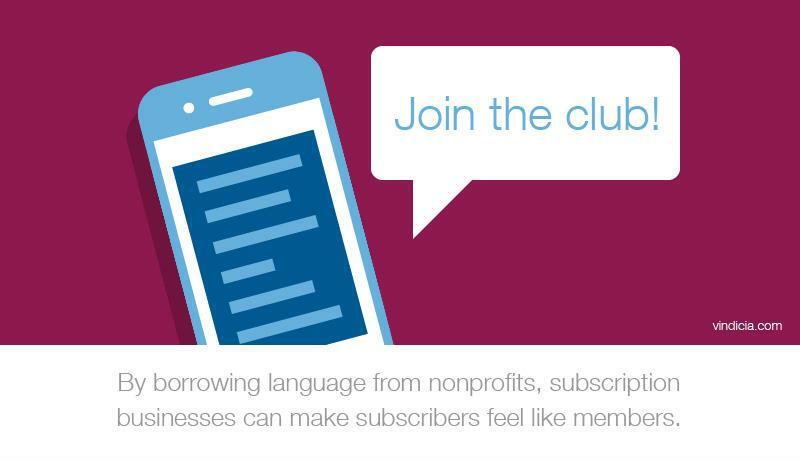 What do nonprofits and subscription businesses have in common? Both succeed on the strength and number of their contributors, whether they are donors or subscribers. Nonprofits are constantly trying to increase their donor numbers along with the size of the donations they receive, just as subscription businesses try to boost their customer bases and upsell additional products or services. Yet, both types of organizations appeal differently to their audiences. Subscription businesses promote the value of their products or services, reminding clients of the benefits they will receive. Meanwhile, nonprofits utilize emotional appeals, employing flattering language and showing donors the impact of their generosity. Often, nonprofits attempt to make donors feel like members of a community, distributing additional gifts and emphasizing a unifying aspect to make them feel important. Both strategies have their advantages. In fact, subscription businesses may find it wise to take a page out of the book of their not-for-profit counterparts. Making their customers feel like valued community members helps lower churn rates and keep subscribers engaged. Subscription businesses can learn from the messaging of nonprofits. According to the 2017 Fundraising Effectiveness Survey Report provided by the Association of Fundraising Professionals, nonprofits averaged a donor retention rate of about 45 percent last year. This rate has been relatively consistent over the decade, although it's primarily because nonprofits are able to attract new donors when old ones stop giving. This is not the takeaway that subscription businesses should emulate. As we've discussed before, maintaining a healthy customer base makes for consistent revenue, allowing businesses to make better financial decisions and predictions. Rather, nonprofits have developed other elements of their subscription services into a fine art. We contend that commercial subscription businesses can learn from their insights and experiences, analyzing successful nonprofit tactics and incorporating these strategies for their own use. This type of language makes donors feel important - like members of a group rather than nameless faces supporting a vague cause. Subscription businesses can do something similar by reminding customers of the emotional reasons for why they became subscribers in the first place. As churn expert Robert Skrob noted, customers join a service because they have a fantasy of what life will be like after subscribing - higher productivity (SaaS products), more information (media and content), constant access to their favorite shows and music (OTT). Mentioning these details reminds subscribers of those motivations, but companies can go further by making them feel like valued members. "You're about to join a community of television and enthusiasts." "Your subscription supports top-quality journalism." If this is the first time your business has tried such a strategy, you may not know where to start. What words will appeal to your customers, and which will be a waste of time and effort? Vindicia can answer these questions for you. By partnering with us, you gain access to what we call the Network Effect: knowledge on payments, subscription billing and churn prevention best practices accumulated from our years of data collection and experience within the industry. Vindicia can help you build your subscription billing infrastructure and optimize your customer communications to boost your retention. That's why they call us the Subscription People. Subscriptions and AI - where do we go from here?